I saw an OCT 10 1963 date stamp on a Ludwig snare with serial number 6747 today on Reverb. The seller described it as a 1968 date stamp, but the ink is red and the drum has a Resa-Cote interior and a red baseball bat tone control. These are inconsistent with the drum being from late 1968. The date stamp looks like a 1963 rather than a 1968 to me. 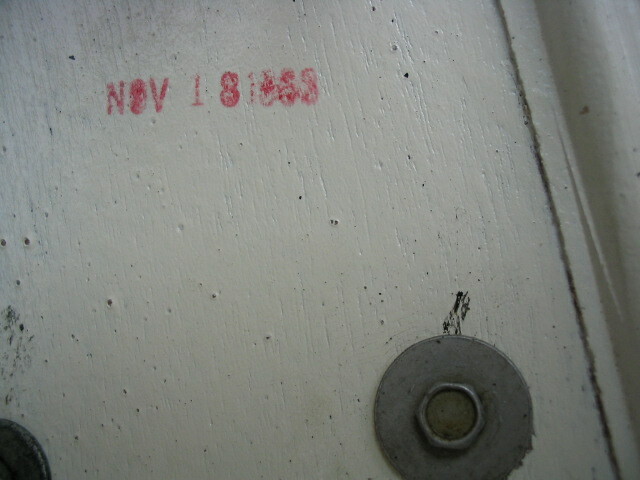 It becomes the new earliest date stamp on a Ludwig drum which has a serial number. It takes the place of a drum Mike Layton reported with a NOV 27 1963 date stamp (SN 1012). Now moved to third place is a Jazz Festival snare I once owned which had a NOV 29, 1963 date stamp (SN 1974). Clearly this drum's serial number does not come close to the lowest, showing the variation that is seen between date stamp and serial number on vintage Ludwig drums. Although this is hardly earth shattering stuff, it is interesting to me to see the earliest date get pushed up more than a month. And where are the other few hundred drums that were, no doubt, produced during that month? They're still out there Rick, waiting for you to track them down . Nice find Rick. Love tracking this type of information. Always looking here as well. Thanks for sharing Rick. I have been looking at places like reverb and eBay to keep track of some of this stuff. Certainly does make me wonder if they actually did start with number one? In all these years of people collecting drums it seems odd to me that 6747 is the lowest recorded number. That is a lot of badges that are unaccounted for if in fact the badges started with number one. There won't be any way to tell unless someone comes up with a really low number. So of course curiosity got the best of me and I looked around a little myself. I happened upon this New Yorker set that is stamped Sep 25 1963 with pre serial badges. I also reread the post as I sometimes miss obvious things and saw that the snare Mike reported was serial number 1012. It still makes me wonder where the numbers started. I have no idea how the badges came shipped to ludwig but if I were to presume they were in a box then I wonder what box they started with? Maybe they got a batch of boxes and higher numbers were given out first? I will say though it's not totally accurate it does seem for the most part that Ludwig seemed to use up badges in a sequential fashion. It would be interesting to know who actually received the badges when they came in to Ludwig, where they were kept, if they were put away in any order, if they were passed out in any order or if they went straight from shipping to work stations. It almost seems like the Ringo craze may have actually been a blessing in terms of dating things because the workers were so busy making product they didn't have time to stockpile stuff. It almost looks like materials were being used up as fast as it came in which makes the numbers on our end a little more consistent. Here is the Sep 25 1963 set. It's interesting to me to see that this set is only roughly 16 days older than the serial number jazzfest yet this set has no serial number badges. Of course as we can see from Zenstat its entirely possible to see that pre serial badges were used on drums after serial number badges arrived so there is the possibility that this Sep set just has pre serial badges even though serial numbered badges were already around. We won't know that until someone comes up with a drum older than Oct 10 that has a serial number. Interesting stuff! I am adding them one at a time. There are lots of questions and not a lot of definitive answers. There was some discussion about the first numbers in the thread that I linked. A quick summary of low serial numbers - I have recorded twelve serial numbers under 1000. None of these had date stamps. I have 104 serial numbers under 10000. Twenty-five of these have date stamps, which range from OCT 10 1963 through MAR 2 1964 and one outlying point of SEP 11 1964. Thanks for the info Rick. It's funny how I can look at an old thread that I even had discussion in and forget some of it. I have been keeping a little note page with serial numbers in it to remind me when certain numbers matched certain years or an oldest and earliest number are. I have them in my phone and its helpful when I see other drums online. Hi Rick , I thought I might add some color to the conversation but really has no bearing to the earliest date stamps to serial number conversation. Thought some here might like the info on one of my kits from 1965. I think you have this info already Rick also. I have a set 20/12/14/5x14 snare that all have shells dated July 7 1965. The bass drum and snare are red stamp and the 12 and 14 floor are black ink. They all have white B.B. mufflers. Probably around the time they were switching to black stamp but thought it was strange that they are all dated the same. Oh yeah also the order of the serial numbers . I tend to think the shells were all made the same day, then were maybe stamped by two separate people and then moved on to the badges, which were all pulled out of the same box. What is your take on this? Anyone elses guess are welcome. Anything I would say would just be a guess, so I do not offer an explanation or theory. It is interesting that two different colors were used on the same day (which I have seen several times) and those drums ended up together in a set (a quick scan of my records reveals that almost all drums within a set have date stamps with the same color ink). These observations are anecdotal and not very scientific. An interesting drum just appeared on a search of recently sold Jazz Festival snares on eBay. https://www.ebay.com/itm/1960s-Ludwig-Blue-Sparkle-14-x-5-1-2-Deep-Jazz-Festival-Snare-Drum/283329157640?hash=item41f7bbda08:g:Cr4AAOSw6iZcMYBx The drum is date stamped "NOV 2_ 1963" (Seller thought it might be 24 but could not tell) and has serial number 0203. Although this is not the earliest date stamp of a drum with a serial number (the topic of this thread), it is the lowest serial number I have recorded thus far, with or without a date stamp. This pushes to second lowest serial number a Supra that has serial number 0273. All had leading zeros as part of their numbers, filling four spaces. When the numbers got into the 1000's, there were no leading zeros. They were four digit numbers until 10000. So we still do not know if the serial numbers started at 1, 0001, 100, 0100 or some other number. We do know that they went as low as 0203. Rotarted you got the "Holy Grail" of Ludwig drums. What color is the 4 BC ink stamp .